Today I presented my last report to University Council. I have really enjoyed working with Council this year: they have supported, challenged and guided me, and always made me feel included. Because of my positive experience with Council, I decided to include, within this final report, my concerns about the nature of student consultation elsewhere in Durham. 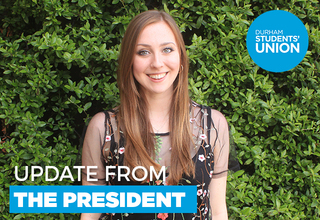 I raised these concerns, as previous Student Officers have, to ensure that future student representatives are treated with the respect they deserve and that their role – to represent the voices of students – can be effectively carried out. The most recent example of a problematic approach to student consultation was over the issue of accommodation fees; I explain what happened fully in this article. Essentially Durham SU submitted a 13-page paper on relative student hardship to a University committee with the understanding that this would result in negotiation and an outcome which all sides could respect. The report was met with a 59-word response. This sends the clear signal that the University was not prepared to consider student voice and we had essentially taken part in a pointless, box ticking exercise. This is unacceptable, and so I met with a group of students to discuss other ways we could make the University listen to us. We decided to hand out flyers with facts about the historic fee increases and their impact at the Open Days. These flyers made it very clear that we love our colleges, but that they are inaccessible to many. Two of our Officers-elect were then removed from University property for handing out these flyers, with the reasoning that they had not pre-arranged this act of protest. As usual, we got an apology; just like the apology we got for the complete lack of consultation on the 08:00 lectures. An apology, however, is simply not good enough. There is some good news regarding the University’s commitment to student consultation. University Executive Committee (UEC) has recently agreed to trial the implementation of our student consultation framework. This will hopefully make the path of consultation clear, and ensure both the SU and University can be held accountable by students for decisions made. The hard work, commitment and perseverance of a number of student representatives has gone into this, and I can’t thank those who have provided their support enough. Unfortunately, there are wider problems that also need addressing with regards to the treatment of student representatives. There is often a huge air of mistrust for student reps. We have papers kept from us, unnecessarily; we have our ideas dismissed; and we are frequently patronised and spoken down to. This treatment often has very sexist roots. The sexism we, and other student reps, have experienced presents itself in a wide range of ways. Though I do believe that many comments are made with no malicious intent whatsoever, it is uncomfortable. It forms yet another barrier to effective student consultation, and it is also just simply wrong. Rosa (this year’s Welfare and Liberation Officer) and I met with the Vice-Chancellor, as previous Officers have, and chatted to him about our experiences. I also outlined specific examples of this behaviour to Council, including comments that had been made at graduation ceremonies – in front of parents – on getting our bikinis out in this weather; being winked at by senior University staff members; and comments on the calorie content of what I am eating. The list went on, and other University staff have spoken to me about similar experiences: it’s got to stop. I raised these issues with Council because I have always been treated much more like an equal by them, and their responses proved that they did indeed see me in this way. I received such strong support from many members that it was genuinely touching. The Chair said that this conversation will be the start of irreversible change, and I do hope that we will begin to see a better environment for women students, staff, and others in our University community from now on. Working with student leaders is a unique dynamic – we’re only here for a year so it can be hard for staff to invest time into creating positive working relationships with us – but that is the nature of our role and by contributing in the way we do, whether that is with ideas or with constructive criticism, we are doing our jobs, working to make the future better at Durham. We like being challenged; we don’t expect negotiations to always reach our ideal outcome. What we do expect is to be respected and treated like equals, and for our contributions to be genuinely considered. Only when student representatives are treated in this way can Durham University claim to be committed to a culture of open and effective student consultation.